The Boston Red Sox will be without an important part of their rotation for the remainder of the season. The Red Sox announced Thursday that knuckleballer Steven Wright, who was an all-star in 2016, will miss the remainder of the 2017 season after electing to undergo knee surgery. Wright was placed on the DL earlier this week and is scheduled to undergo the surgery on Monday. He’s expected to make a full recovery and be ready for the start of the 2018 season. Wright had a breakout season in 2016, going 13-6 with a 3.33 ERA in 24 starts, including four complete games. Heading into the season, he appeared to have solidified a spot in Boston’s rotation, even among three former Cy Young winners. However, Wright has had a world of trouble this season. In five starts, he’s 1-3 with an 8.55 ERA, getting knocked out in the 4th inning or sooner on two occasions. Of course, a less-than-healthy knee may explain his poor performance. According to Wright, he’s had discomfort in his knee dating back to spring training and has been wearing a knee brace as a precaution since late in spring. The pain reportedly became worse on Sunday, one day after his most recent start. Wright was placed on the DL Tuesday and sent for a second opinion. Wright and the Red Sox didn’t recognize the seriousness of the injury until the 32-year old righty underwent an MRI. There is also uncertainty with regard to the origin of the injury. Regardless of the origin, Wright will soon undergo a cartilage restoration procedure on his left knee. Meanwhile, the Red Sox, who began the season with six starters battling for five rotation spots, are for the moment down to four starters, as David Price continues to slowly work his way back from the elbow injury that sidelined him during spring training. The Red Sox will call upon veteran Kyle Kendrick to fill Wright’s spot in the rotation, at least for the time being. Kendrick was already in line to start Thursday’s series finale against the Orioles prior to Wright being ruled out for the season, but now he has a chance to audition for a full-time role in Boston’s rotation, at least until Price is ready to return, although that could be several weeks away. Kendrick hasn’t pitched in a major league game since 2015 when he posted a 6.32 ERA while making 27 starts for the Rockies. 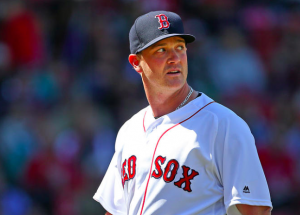 He posted an impressive 2.18 ERA in 33 innings for the Red Sox during spring training, but he’s struggled in four starts at triple-A, going 1-3 with a 6.00 ERA. Nevertheless, the Red Sox are giving Kendrick a chance over younger options like Brian Johnson and Henry Owens. Heading into the season, Boston was expected to have one of the top rotations in baseball. With Wright struggling and now joining Price on the DL, that hasn’t exactly panned out as expected. The Red Sox still have the pieces to have one of the better rotations in the league, but until Price returns, their depth will be tested more than they were expecting with six quality options heading into spring training. As for Wright, his time with the Red Sox is far from over. He remains under team control through 2020 and will be arbitration eligible for the first time this offseason. Despite a major injury setback, he figures to be back in Boston in 2018 and competing for a spot in the starting rotation.